These words gave me food for thought along the mountainous road. What message was this sign sending? I am not welcome with my ESV or NIV or NASB? Hopefully not, but it was a clear statement of preference, wasn’t it? Living in Dallas for so long I was exposed to outstanding Bible scholarship. I learned the whys and wherefores of Bible translations, version, editions, and paraphrases. I understood the beauty of the language authorized by King James. When Bible verses come to mind they are often in the language of the haths, thees, and thous. I memorized the words so lyrically recited by pastors, Sunday School teachers, and parents. But I also learned of the more accurate translation skills of later versions. 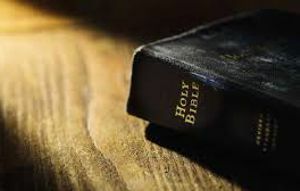 I know there are strong, Bible-believing and living Christians who hold to the authorized version as the only trustworthy “sword.” This is a valid preference, but it shouldn’t dictate rules of fellowship. Our list of hills we are willing to die on is already way too long. I started thinking about my own hand-lettered, large font signs I may wear around like a sandwich board. Do I determine the who and how of community based on preference, not principle? Where do I draw lines then broadcast my positions loudly so everyone understands exactly where I stand? Where is the liberty and love so badly needed in human interaction? I am hopeful I would be welcomed into their Sunday service even without the KJV and I so desire to be clear that preference isn’t dogma.